Rock and Roses The full color Rock and Roses graphic, designed by Corey Miller, is available in ..
An amazingly detailed piece of work that brings together the life and death symbolism of the serpent.. The snare drumhead in 14” size feature a 12-mil Suede® single ply film for excellent durab..
Remo 14'' SkyntoneThe Skyntone drumhead is a fused poly-spun fiber 8-mil film with a na..
Remo 16" Starfire ChromeThe Remo Starfire Chrome head is one of Remo's the speciality range..
Remo 18" Starfire ChromeThe Remo Starfire Chrome head is one of Remo's the speciality range..
Remo 18" Starfire Chrome Bass DrumThe Remo Starfire Chrome bass drum head is one of Remo's ..
Remo 20" Starfire Chrome Bass DrumThe Remo Starfire Chrome bass drum head is one of Remo's ..
Dragon Skyn The Dragon Skyn graphic, designed by Corey Miller, 12-mil Suede® Skyndeep, single-ply..
Remo 22'' Rock and Roses Powerstroke 3 White Bass DrumRock and Roses The full color Rock.. 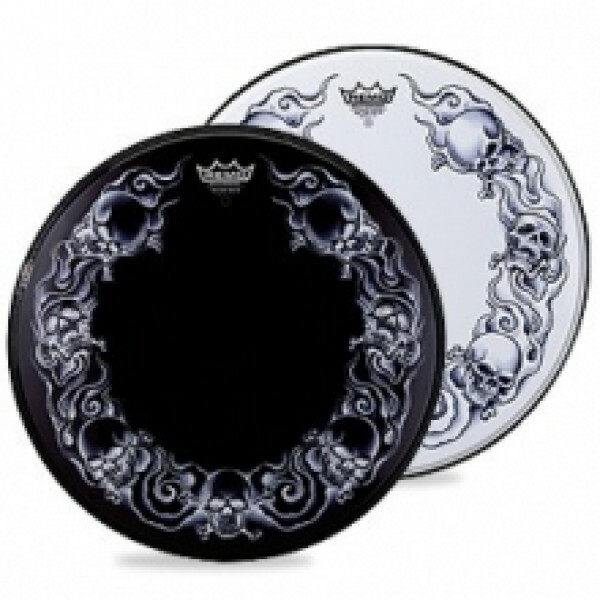 The 22” Powerstroke® 3 bass resonant heads feature a 10-mil film and a 10-mil inlay ring f..
Remo 22'' Skulls Powerstroke 3 White Bass DrumThe 22” Powerstroke 3 bass resonant ..
Remo 22" Starfire Chrome Bass DrumThe Remo Starfire Chrome bass drum head is one of Remo..
Remo 22" Starfire Gold Bass DrumThe Remo Starfire Gold bass drum head is one of Remo's..
Remo 24" Starfire Chrome Bass DrumThe Remo Starfire Chrome bass drum head is one of Remo&#..
Remo 26" Starfire Chrome Bass DrumThe Remo Starfire Chrome bass drum head is one of Remo&#..
Remo 28" Starfire Chrome Bass DrumThe Remo Starfire Chrome bass drum head is one of Remo&#..
Remo 8" Starfire ChromeThe Remo Starfire Chrome head is one of Remo's the speciality range ..